Dominique “SonicFox” McLean has won titles in a number of games, but in Dragon Ball FighterZ, he found his challenge in Goichi “Go1" Kishida. 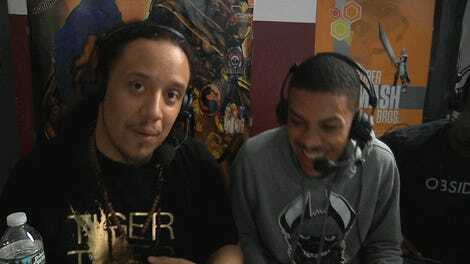 After losing to Goichi in several tournament and exhibition sets, McLean finally got his tournament win last night in a heated grand finals at Combo Breaker 2018. Taking the stage in his full fursuit (McLean is a member of the furry community), McLean removed the larger pieces and got ready. He was coming in from the winner’s side, having already eliminated Goichi once in the winner’s finals. Despite Goichi’s stonewall defense, McLean’s new team of Cell, Kid Buu, and a devastating anchor in Gotenks threw out mix-up combinations that thwarted Goichi’s guard. It was a different look from the style McLean ran at tournaments like Final Round 2018, where this rivalry first started, but it enabled him to mix up, scramble, and pressure like he wanted to, enough to take the first set against Goichi on his way to the top. It was such a triumph for McLean that even though it was winner’s finals, and not the grand finals, he popped off anyways. But once wasn’t enough for McLean. To really cement the victory, to prove it wasn’t just a fluke, he’d have to take down Goichi again and take the finals. Goichi needed to reset the bracket and run it back due to the double elimination rules, while McLean just needed three wins before Goichi could get three. It seemed like during his brief time in the loser’s side of the bracket, Goichi had recuperated a bit from the earlier loss. His team, led by Bardock this tournament instead of the Adult Gohan from Final Round, was still as deadly as ever, and he was a little more prepared for what he was about to face. Dropping only one game to McLean, Goichi withstood McLean’s onslaught and reset the bracket at 3-1. Goichi’s Bardock had too much space to move, and his Vegeta assist was making it too easy to keep McLean’s onslaught at bay. McLean’s winner’s bracket finals win was filled with moments where he forced Goichi to guess which direction an attack would be coming from, often called a 50/50. It’s what his three chosen fighters excelled at, and it was the silver bullet for the Goichi defense. McLean seemed to note that, and in the ensuing games, started to throw tougher mix-ups at Goichi, utilizing the assist of Kid Buu and Gotenks’ wide arsenal of hits to throw the defensive master for a loop. 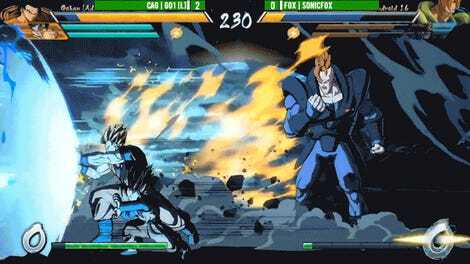 Throughout the games, Gotenks was the X-factor that kept breaking through Goichi’s wall. In game 2 of the second set, McLean’s Gotenks ran over all three fighters on Goichi’s team—converting a three-man power play into tournament point. By the time game 3 came up and McLean had whittled Goichi’s squad down to his last fighter, the result seemed clear. 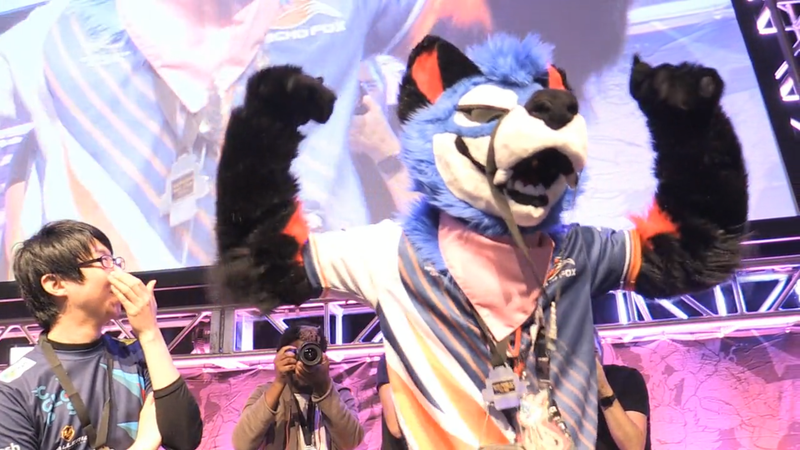 SonicFox had conquered his demons, found his team, and taken his trophy. Chants of U-S-A came up from the crowd as McLean popped off, celebrating the win he’d been chasing since Final Round 2018. The emotion of the moment was captured on video, photo, and phones all around the venue, but photographer Stephanie Lindgren got what I feel was the best shot of the night: McLean, triumphant, in front of a roaring crowd. McLean and Goichi are somewhat the Goku and Vegeta of Dragon Ball FighterZ, constantly sparring and vying for the top. And here, with a big win at Combo Breaker, McLean proved that Goichi was not in a league of his own. The upcoming Summit of Power, where both will meet again, will certainly be interesting.